The title track off of JAY-Z's new album 4:44 is JAY-Z's public apology to Beyoncé for past indiscretions in their relationship. On the track, which features vocals from gospel singer Kim Burrell, JAY-Z comes out and immediately admits to his infidelity, saying, "I apologize, often womanize/Took my child to be born/See through a woman's eyes/Took for these natural twins to believe in miracles." Following the release of Beyoncé's Lemonade last year, rumors started swirling about JAY-Z having cheated on his wife. 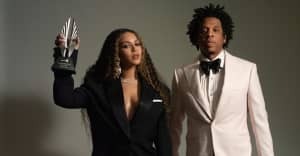 Bey's visual album depicted the fall out and reconciling of a relationship in the wake of adultery, leaving many to wonder what was going on behind closed doors at the Knowles-Carter residence. On "4:44," JAY-Z apologizes profusely, admitting to Beyoncé that he "toyed with your emotions because I was emotionless." The song ends with a nod to their growing family, with Jay rapping, "And if my children knew/I don't even know what I would do/If they ain't look at me the same/I would probably die with all this shame /'You did what with who? '/What good is a menage-a-trois when you have a soulmate/You risk that for Blue?" The next song on the album, "Family Feud," features vocals from Beyoncé and includes JAY-Z rapping the line, "Leave me alone, Becky." The line is a reference to Beyoncé's iconic "Sorry" lyric about "Becky with the good hair" AKA the woman Jay was cheating with. Stream "4:44" on TIDAL below.